Heart Touchers - The Most Touching, Heartfelt Gift You Can Give -- Guaranteed! Let Michael Make You The Perfect Gift For Any Occasion! Make Your Memories Come Alive! Fond memories . . . Everybody has them, but as the years go by the images stored in our minds lose their clarity and start to fade. If you are like most families, you have pictures, slides, or home movies of these precious times. From time to time, you'll gather the family around as you dig out a box full of pictures, or the old movie projector to view the parts of your life that has been captured on film. The family grows closer as you re-live the "good times" together. Wouldn't it be nice to be able to gather the family and bring back the memories without the hassles of a projector, screen, broken film, or a box full of loose pictures? How about transferring your pictures, slides, or home movies over to DVD? The family gets together and all you have to do is put the DVD in the DVD player! Best of all, your entire video is set to music that makes your images come alive! Seventeen years ago I started producing videos for my family and friends as gifts to them at special times of the year. I really enjoyed seeing the looks on their faces as they watched my video for the first time, and I knew then and there that I wanted to get into video production. I take a tremendous amount of pride in each project that I produce and I feel that it shows in my work. When a family comes to me with a project I treat their memories as if they were my own, and therefore, I make sure I give each and every project a personal touch that has become my trademark. Your home movie film and photographs are precious to you. At Video Imagery we believe you deserve both personalized service and the highest quality transfer possible. That is why we utilize the latest in digital technology. You can watch your home movies on your TV...no more rummaging in the basement or attic to find the old projector. As film ages it quite oftens becomes brittle, or even worse, is attacked by mildew if stored improperly in a humid area. Mildew can totally destroy your precious family moments. Why take the chance of losing these memories? Additionally as time passes, the ability to repair old projectors is becoming quite limited due to lack of parts (these old projectors are no longer manufactured, the manufacturers have discontinued making them, or the manufacturer is no longer in business). Please don't risk the precious family memories, convert them to video now. Another kind of transfer takes photos and/or slides of loved ones and develops them into a personal video tribute with the addition of appropriate musical backgrounds. The end result is a treasured keepsake intended to celebrate a person's life. This Video Portrait is made to tell a story. We cherish the memories it brings back and are comforted by its familiar faces...which we can share with loved ones again and again! Below is a taste of what we can do for you at Video Imagery. Hit the play button and the video will begin playing in a lesser quality format through YouTube. This is nothing near the quality that your finished video will be. Be sure to adjust the quality to one of the higher settings at the bottom of the video screen so you can view what your video will actually look like. Have your photos set in pan and scan motion! Just like the Ken Burn's style you are used to seeing on TV! Each photo will slowly move to give an added dimension to the emotion of your project. Cost is $1.50 per photo. Or you can choose to have no motion in your photos. The image stays still on the screen in between transitions. Cost is $1.00 per photo. If your pictures are already digital you can take .25 off of each photo, as we will not have to scan them. Ask for a demo DVD to help you decide which one to get! Music, title, and graphics added free of charge! Each job varies in length...We have transferred as few as 50 pictures and as many as 2500 for one family. 150 photos would give you a 20 minute finished video while 500 photos would give you a 60 minute finished video. Click below to find out how easy it is to get your photos ready to be transferred and sent off to us! 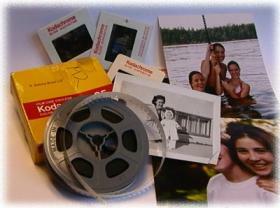 Click Here For Home Movie Transfer Prices! Give the Gift That Says "I Love You"
When you give this kind of video to someone you are not just giving them a material present. You are giving them a nostalgic, emotional experience that touches their very heart and soul and is guaranteed to bring your family closer together. On any special occasion, don't worry about finding the perfect gift. Let me make it for you. Give the gift that says, "I love you." Questions? Call Michael at: (608) 757-1938 or E-mail Him For Your Free Demo DVD! Check Out Our Wedding Video Services! If you live in the Southern Wisconsin/Northern Illinois area, and would like your wedding videotaped then visit the link above! We'll go anywhere in the U.S to videotape your wedding! Email us for details! We will also transfer any video footage you currently have over to DVD! Preserve your precious videotape moments by transferring them over to DVD format! No more broken tapes, video dropout, and or faded video. DVD provides you with incredible picture quality which will never deteriorate! DVD Transfer Prices: $10 for up to one hour. $15 for up to 2 hours. Videos With A Personal Touch! Since 1991 Video Imagery has produced over 5000 videos for families across the nation. Here are just a few of our happy customers! "Great job on our video. We're sure it took a great deal of time and we really appreciate it. You do wonderful work." "Thank you so much for the great video! It was obvious that you put a great deal of time and effort into it, and I really appreciate it. You are very good at what you do." "We wanted to compliment you on the video you did for Scott and Shannon. We showed it to friends and relatives and had many, many tears. It was wonderful the way you put all the music together and coordinated everything!" "The video you did for me brought tears to my eyes. I will treasure it forever. Thank You!" "I thought of you first after my family sat down to watch the video we gave them. They loved it, to say the least! Within thirty seconds my mom was crying and my dad did too. They said it was the best Christmas gift we could have given them!! You did such a beautiful job! They were so surprised and so touched---they really, really, really loved it. Thanks for helping to make it so special to us all. My mom mentioned how the songs were perfect for the video too! Thanks again!" "Thank you so much for our video. It's just fantastic! It's amazing how you piece all the photos and music together. We can only imagine how many hours it took to do something like this, and we wanted you to know that we cherish all of the videos you have done for us." 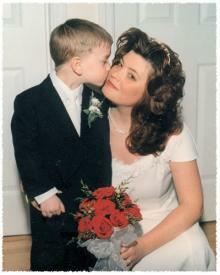 "I just wanted to take another chance to say thank you for making the video of my mom. She loved it and that made me feel great. You made my Christmas very special." "I wanted to tell you that the video was wonderful. I've seen my dad with tears in his eyes twice, and today was one of them. Everyone really enjoyed the video as you did an excellent, excellent job. Thank you so much!" "My whole family wants to thank you for the wonderful job you did on the video. Time went by so fast we never got a chance to call and let you know how happy we were. We had wrapped one and put the other in the VCR. We started it and they were so surprised. My dad was speechless, which is a rare thing, and it brought tears to my mom's eyes. They loved it!! We know it was really time consuming, and we wanted to thank you and your wife also. She was always so nice whenever we called with any questions. Thanks again and have a wonderful holiday season."